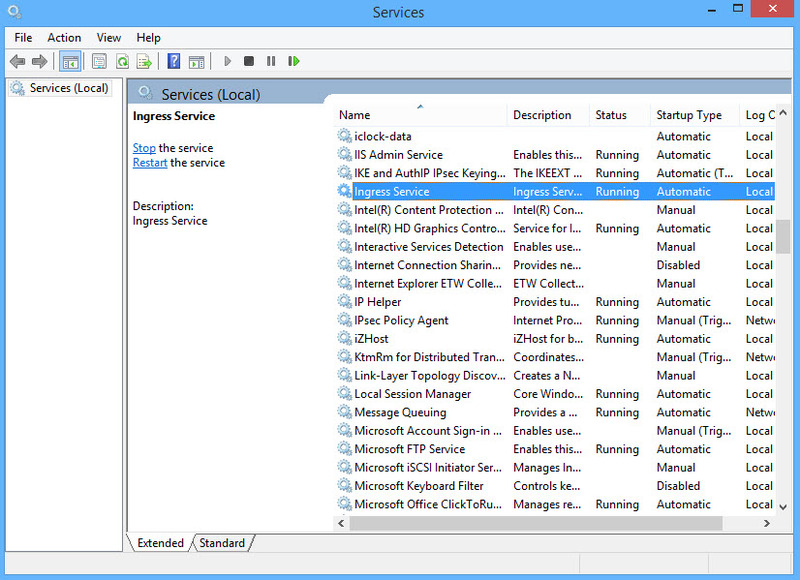 9 Common Mistakes Committed in Ingress, Avoid Them for A Successful Installation. Ingress is an integrated access control management software that is running on MySQL or MS Access database platforms, totally different platforms but recent and better platforms as compared to the Visual FoxPro of TCMS V2. Ingress provides elaborate access control features and it comes with amazing time attendance functions consolidated in a single unified system with more focus on user-friendliness. With the various functions that our Ingress software is capable of and the new look and feel of the software, misssteps when setting up any tabs could happen and hence, jeopardizing the whole system. Go through this list of common issues users often encounter and compare them with what you are doing. When you follow them right, Ingress will be up and running in no time and you’ll find more treasures in Ingress than you ever thought available. When I start my Ingress, I encounter “Unable to connect to Server” error. Have you run the DB installer? This error appears because the connection between Ingress and MySQL server has been broken, probably due to network change. 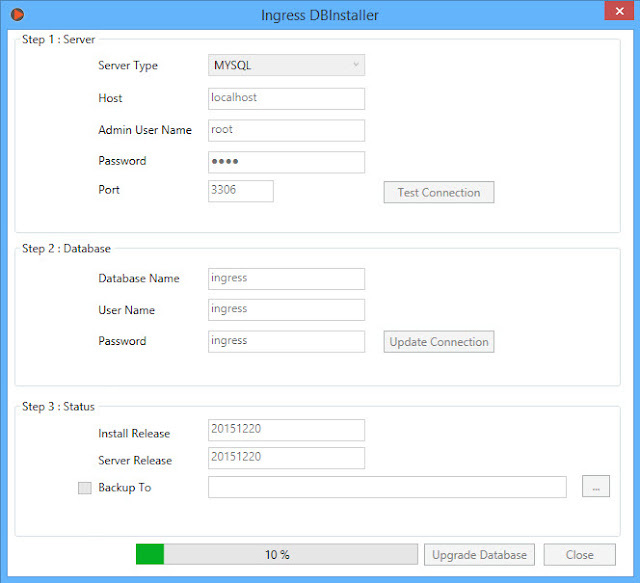 To re-establish the connection between Ingress and MySQL, you need to run the DB installer. i) Change of range in the network IP. ii) Ingress updated to a newer version. I can’t seem to establish a connection from Ingress Client to Ingress Server. What could be wrong? You need to make sure that you have done these three crucial settings. select box before you proceed. For more info regarding the connection between the Ingress Client and Ingress Server, refer to the link HERE. Restoration of the DB usually takes a very long time, sometimes up to a few hours. How can I speed up the restoration process? 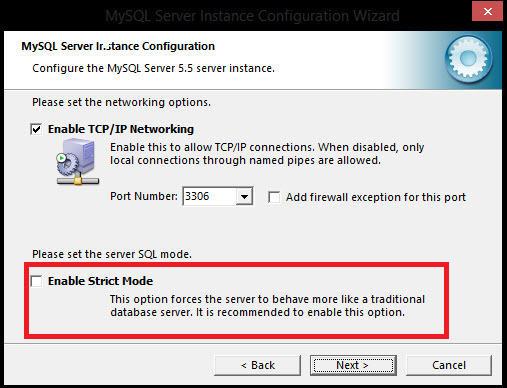 Have you downloaded SQL Manager software? This is a useful tool to use during data restoration because Ingress reads the database line by line to minimize error, whereas the SQL Manager reads the database by batch. By using SQL Manager, restoration time can be minimized. For a step-by-step guide to backup and restore Ingress DB, click on the link HERE. Each time I restart my Ingress Server, my Monitoring page does not show any records unless I restart the services manually. You need to set the services to Auto Restart. 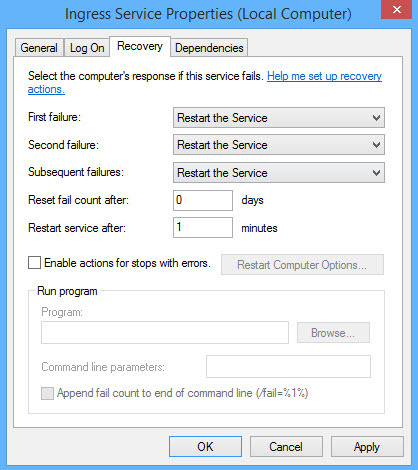 You can set the services to Auto Restart each time the service stopped. 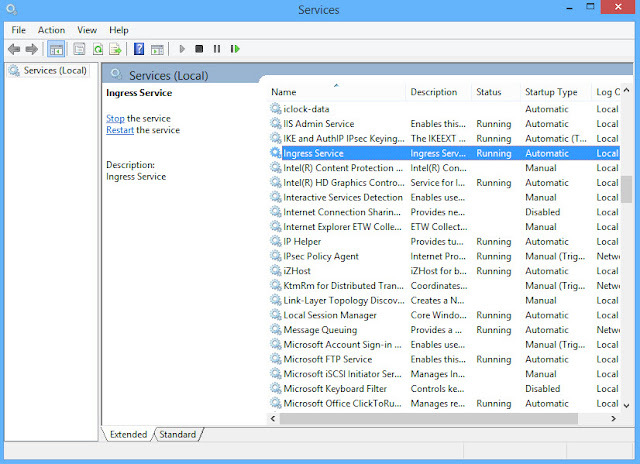 Go to Services > Ingress Service > Right Click > Properties > Recovery > Change to Restart the Service. 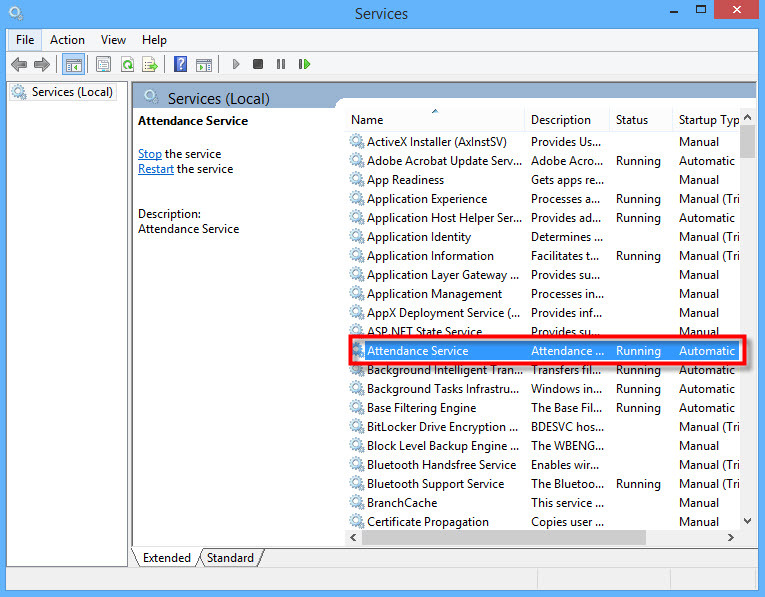 Repeat the steps for Attendance Service as well as MySQL Service. I couldn’t find any monitoring data and audit list appearing in Monitoring Tab. Help! You need to assign the terminal(s) to a door. After adding the standalone terminal in Devices, please make sure that you add the terminal in Doors in order to get the Door/Zone or Real-time monitoring. 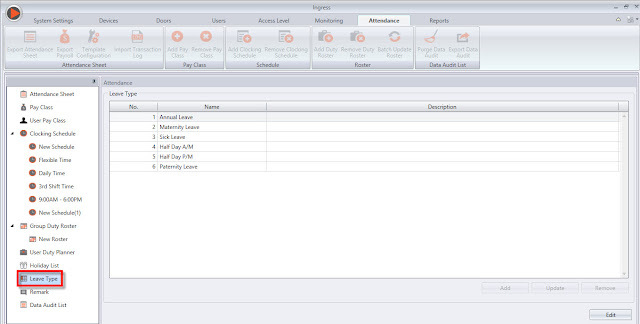 Otherwise, you will only be able to see the transactions in the log list. Follow the steps in the link HERE below on what you should do to use Ingress Software solely for attendance. I don’t know how to Assign Leave to users? 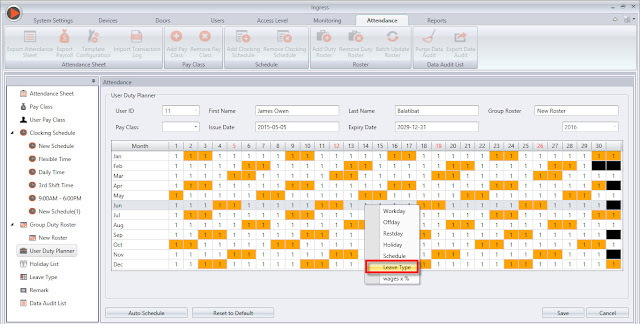 Before you can proceed to assign leave to users, you will first need to create the leave type at Attendance Tab > Leave Type. Proceed to User Duty Planner to assign leave to each user by following the steps below. How to change Shift for a user without affecting the rest of the users in the same group? What is Range? Have I been using it wrongly? Go to Clocking Range tab. 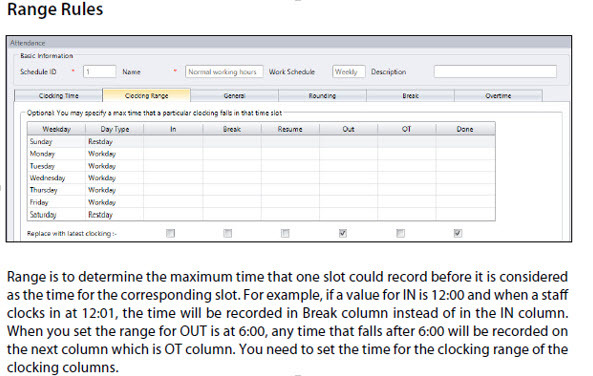 Range is to determine the maximum time that one slot could record before it is considered as the time for the corresponding slot. By default, if this time slots are left empty, Ingress will take the midpoint of two clocking columns as results. In doubt, leave range alone until you understand how it works. Report Scheduler not working accordingly. 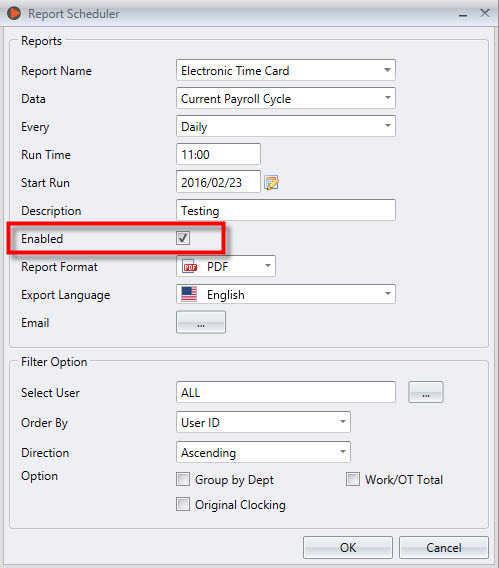 If the report scheduler is not sending out report automatically, check on these 3 following things. 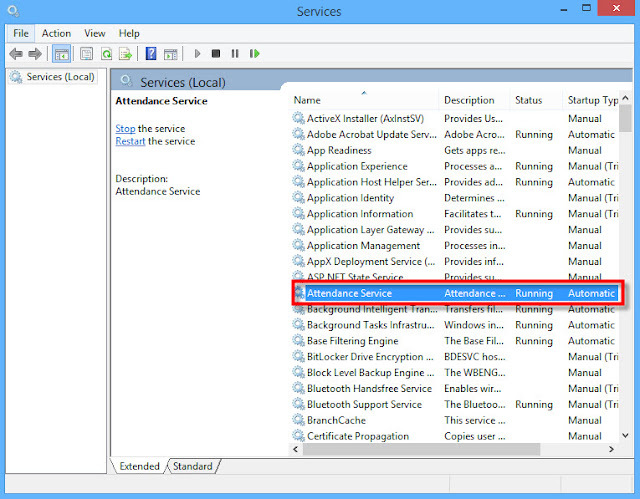 1) Whether the service has been started and running? Sorry to inform that nothing we can do if you forgot your MySQL password. We only can help just in case you forgot the password to enter your software,which is Ingress/TCMSv3/TCMSv2. 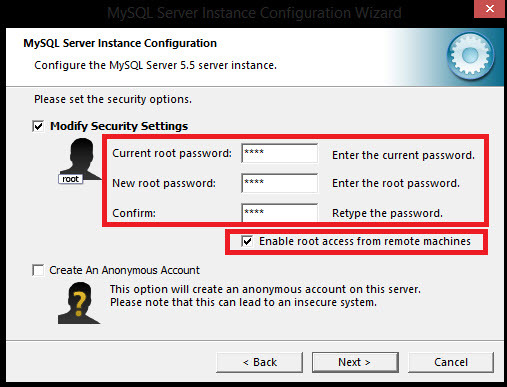 That's why we never change the MySQL password. We just use root/root during the installation.